Transformers: Shadow Rising is the follow up to the successful; Transformers Human Alliance. Shadow Rising see’s players fight their way across various continents, alongside popular movie characters Bumble Bee, Optimus Prime and Sideswipe in order to stop Megatron’s evil plans. 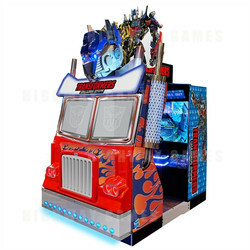 The arcade cabinet is set in the truck vehicle mode of Optimus Prime. New features of this machine include the ‘Hyper Energy Tech’ lever which unleashes a shock wave on multiple enemies and protects the player from difficult attacks.